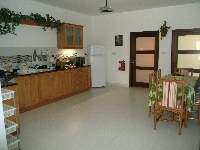 Welcome to our selection of holiday rentals in Malta. Malta has a significant history that spans over seven millennia with remains of megalithic structures and remains such as the bones of a pygmy elephant dating to prehistoric times. Due to their strategic location they have been of military and trade importance to many civilisations including the Phoenicians, the Greeks, the Romans, the Arabs and many European countries including those of Germany, Spain, France and the island of Sicily. They were also under the protection of Britain until 1964 when they gained their own independence. This combination of cultures has provided a resilience that gained them the George Cross from King George VI for their heroism that helped the Allies win the Second World War. There are many museums throughout Malta and the neighbouring islands of Gozo and Comino that have preserved and recorded their heritage. 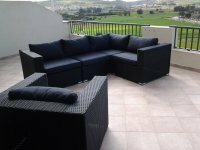 A visit to Malta�s gardens and the National Park of Ta� Qali are small compared to other European equivalents but they offer pleasant scenic views. The National Park itself is popular with locals and houses memorabilia from the Second World War including aircraft and other vehicles. 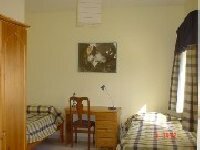 It also houses an excellent Crafts Village � great for the distinctive souvenir. The Park and the gardens are also an excellent cooling breather from the warm sun that blesses the lapped shores of Malta�s beaches. The temperatures average around the 30�C mark soaring to the sizzling climb of 40�C in August with the winter season around the cooler range of 15�C. The winter can be wet but it can also have days when the clouds clear and a glimpse of the coming summer brightens the winter blues. During the warmer peak seasons of spring and summer the beaches, the beach resorts and lidos offer many opportunities for a relaxed bathe and some prefer to take to the rocks for spots of isolated sun worshipping or diving. The coast provides excellent water sports with boards and vessels taking to the sea providing adrenalin seekers, seafarers and anglers an abundant supply of Maltese hospitality. 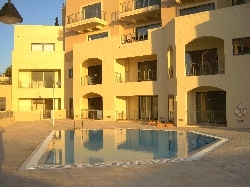 Looking for self catering holiday accommodation in Malta?, then below is a selection of villas in Malta and apartments in Malta that can be rented direct from their owners. You can either click on each listing for further details or you can use our search engine on the left if you are looking for something in particular.